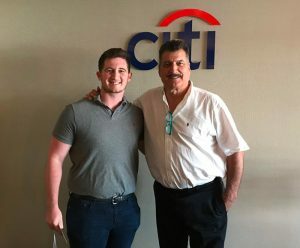 Alec Bieber ’18 is pictured left with Keith Hernandez at Citigold event at Citi Field. Alec is from Scarsdale, New York, located just North of New York City. Following his mother’s lead, a Syracuse alumna of the Class of 1988, Alec grew up visiting campus to cheer on the Orange in the Carrier Dome every winter. It was at Syracuse that Alec, an avid sports fan, discovered the sport management major at Syracuse University’s Falk College. “I could find no better major for me to combine my passion of sports and my ultimate career goals and aspirations.” He was accepted into the program and transferred to Syracuse University in 2016. Now, two years later, Alec is completing his senior capstone in New York City, where he has been working for Lagardère Sports & Entertainment since May as a Strategic Consulting Intern for Lagardère Plus, gaining real-world experience. And this is the third internship he’s had at while at Syracuse, previously at Morgan Stanley and then at MLB Advanced Media in the E-Commerce department, which fixed his career choice in sport management. Similarly, Alec has been inspired and mentored by the alumni connections at SU, particularly alumnus Brandon Steiner, chairman of the Sport Management Advisory Board and CEO of Steiner Sports. “I’ve known Brandon for number of years, and as I have matured and began my career, he has always stood as a source of inspiration and guidance,” he says. In his career, Alec hopes to head his own sport talent agency or sport media company.